This is actually a GREAT question! Yes, the Skin Renewal System is a great basic, daily skin care regimen that will help maintain skin health. However, there are THREE different types of skin on our faces. And all three have different needs. For instance, the lips have no oil glands and require outside moisturizing means. The eye lids are the opposite and have several oil glands that can easily clog. They require an oil-free product and one that is non-comedogenic. Obviously, the third type is simply our facial skin. As it ages, the natural anti-aging processes slow and require help. This is why Dr. Beckman, the brilliant man that he is, developed additional, targeted products that work synergystically and with purpose. This way, you can personalize your skin care routine to best suit your needs. 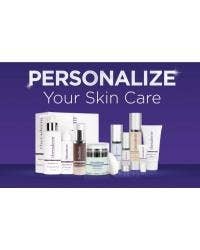 Another common question is, “When I add the targeted products to my routine, how do they work together and is there a right way or wrong way to apply them?” Yet another great question and the exact reason we created the “Personalize Your Skin Care” card. Below is the order you should be using the products. We have also included the reasoning behind the specific order and what that particular product is doing for your skin. NuPeel Natural Enzyme Peel. 2-3 times a week on dry skin. Non-abrasive, micronutrient-rich gel removes the top layer of dead skin cells, which allows the active ingredients in the remaining products to penetrate more deeply and evenly. Also contains Argireline® and retinol to stimulate collagen production to reduce fine lines and wrinkles. Cleansing Wash. 2 times daily. Cleanse and refresh your skin with this soap-free, oil-free, and fragrance free formula that removes dirt, oil and makeup-up without drying skin. Fruit Acid Exfoliant. 2 times daily. 10% lactic acid stimulates and accelerates cell turnover and collagen production for a healthy, radiant glow. Lactic acid also acts as a “transporter” and delivers active ingredients deep beneath the surface for greater efficacy. Gentle Action Application Pads. 2 times daily. For optimal results of the Fruit Acid Exfoliant, use these! Not to be confused with cotton pads available at drugstores, the innovative texture of these pads allows another level of mild exfoliation, optimizing the absorption process of active ingredients. Enlighten Skin Brightener. 2 times daily. Kojic acid, L-Arbutin and Swiss garden cress extract reduce hyperpigmentation and brighten skin gently. Hydroquinone-free, which eliminates the need to cycle off and on this product. Using after the Fruit Acid Exfoliant greatly enhances the benefits of this product. OPC Reparative Gel. 2 times daily. Repair sun-damaged skin and inhibit future UVA/UVB radiation damage with the powerful antioxidant, Pycnogenol. Also protects and assists the repair of collagen and elastin which are necessary for a strong skin matrix. Eternox Peptide Crème. 2 times daily. Packed with an exclusive combination of three peptides, Soluble Keratin Peptide, Matrixyl® and Argireline®, this lightweight crème stimulates the production of collagen which increases skin firmness AND reduces the appearance of moderate lines, wrinkles and furrows. It is important to apply this product prior to the moisturizer in order to have the peptides directly on the skin so they can work their magic! Peptide Repair Eye Crème. 2 times daily. Combination of two peptides, patented Soluble Keratin Peptide and Argireline®, work together to reduce lines, crow’s feet and wrinkles. Caffeine and Saccharomyces cerevisiae extract lessen the appearance of puffiness and dark circles. This oil-free, non-comedogenic formula won’t clog pores. It is important to note this product needs to be applied directly to skin prior to moisturizers. Peptide Hydrator or Enriched Facial Moisturizer. 2 times daily. Replenish the moisture barrier with your choice of moisturizers. Peptide Hydrator provides light hydration for normal, combination or oil-prone skin. Enriched Facial Moisturizer is formulated with superfine lanolin to hydrate dry or mature skin. Anti-Aging Lip Complex. 2 times daily and as needed throughout the day. We know it isn’t on the card – but it’s still important to take care of your lips. This product contains the peptide Matrixyl® to reduce lip lines while preventing lipstick feathering and enhancing lip volume. Avocado oil and Vitamin E provide superior hydration all day. Platinum Protection Facial Sunscreen. 1 time daily in the am. Protect your skin AND the results of a great skin care routine with Theraderm’s Platinum Protection Facial Sunscreen. Broad-spectrum, oil-free, non-comedogenic – what’s not to like about this product? Formulated to be cosmetically elegant, it absorbs quickly and leaves skin prepared for makeup application….if you even need makeup after following this skin care regimen! And to make life even easier, here is a “Personalize Your Skin Care” card for you to click, download, print and use!